A massive plume of Saharan dust appears currently across the tropical North Atlantic Ocean in the latest image product provided by University of Wisconsin/CIMMS (above). Known as the Saharan Air Layer, this dry, dusty air mass forms over the Sahara Desert during late spring, summer and early fall, and typically moves westward over the tropical Atlantic Ocean every three to five days. The Saharan Air Layer extends between 5,000 and 20,000 feet in the atmosphere. When winds are especially strong, the dust can be transported several thousand miles, reaching as far as the Caribbean, Florida and the U.S. Gulf Coast. The dry air associated with the Saharan Air Layer often suppresses hurricane and tropical storm development. Large quantities of dust entering the Atlantic during the summer hurricane season create a stable layer of dry, sinking air, which prevents storms from spinning up or gaining strength. Each year, over one hundred million tons of Saharan dust gets blown across the Atlantic, some of it reaching as far as the Amazon River Basin. The minerals in the dust replenish nutrients in rain forest soils, which are continually depleted by drenching, tropical rains. One of the most amazing stories in the world of weather and climate in recent weeks has been the dramatic cool down in the North Atlantic. 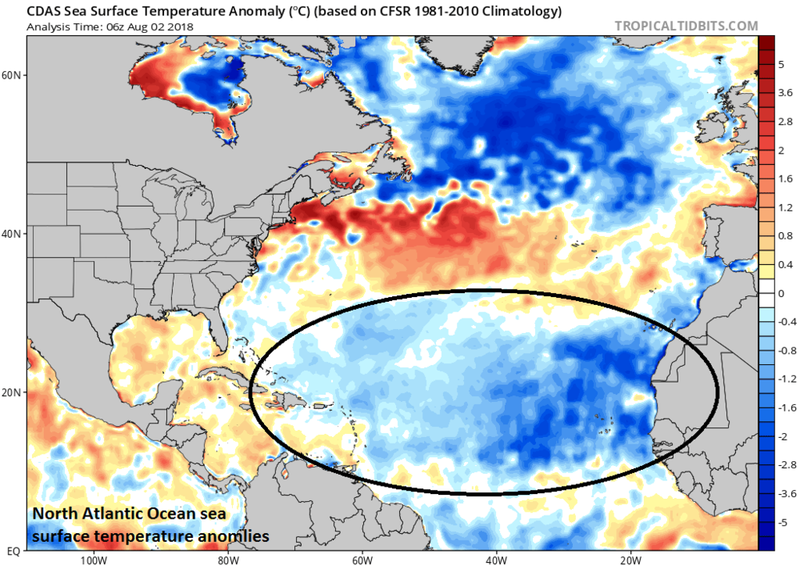 Tropical Atlantic sea surface temperatures (SSTs) (10-20°N, 60-20°W), averaged over last ten days of July, were the coldest on record since NOAA daily SSTs became available in 1982 (source: Philip Klotzbach, Colorado State University. Empirical observations suggest tropical storm formation in the Atlantic Basin generally requires sea surface temperatures of around 26°C or higher and the below-normal water temperatures off of Africa’s west coast is very likely acting to suppress overall activity with respect to "African-waves". While colder-than-normal water has been rather persistent since the early spring off the west coast of Africa, it has not been until more recently that water temperatures have turned noticeably lower in the area surrounding the southern half of Greenland. Wind shear refers to any change in wind speed or direction over a short distance within the atmosphere and it is an important factor in controlling tropical storm formation and intensification. In the case of tropical storms, wind shear is important primarily in the vertical direction from the surface to the top of the troposphere. Tropical storms are “heat engines” powered by the release of latent heat when water vapor condenses into liquid water and wind shear suppresses development by removing the heat and moisture needed from near their center. Wind shear will tend to distort the shape of a tropical storm by blowing away the top portion from the lower portion and the resultant tilted vortex is usually a less efficient heat engine. The latest computer model forecast (NOAA CFSv2) of bulk wind shear indicates it’ll remain rather high in much of the tropical Atlantic and Caribbean Sea during the August/September/October time period. This is a reasonable forecast, in my opinion, based on the idea that an El Nino (warmer-than-normal water) is likely to form by the fall in the equatorial part of the Pacific Ocean and that usually results in increased wind shear in the tropical Atlantic which, in turn, inhibits tropical storm formation and intensification. While there are inhibiting factors for tropical storm activity in the Atlantic Basin going forward, it is no time to let your guard down; especially, if your located in the eastern or southern US. Sea surface temperatures are actually above-normal in the Gulf of Mexico and in much of the western Atlantic and the forecast of bulk wind shear in August/September/October is quite low in these same areas – both favorable factors for tropical activity. As a result, odds for what I call a “home-grown” type of tropical system – one that forms near the eastern or southern US coastline and not off of Africa's west coast – are not at all insignificant even though the overall Atlantic Basin season may turn out to be less active than last year. One final note, while the tropical activity in the Atlantic Basin may turn out to be somewhat subdued compared to 2017, the Pacific Ocean is likely to experience a very active season and more active than last year as its sea surface temperatures are warmer-than-normal in many areas.